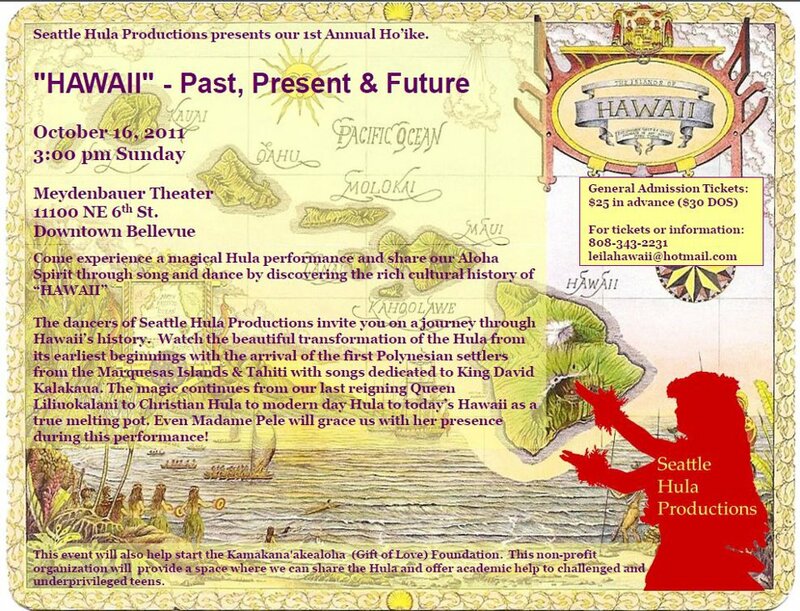 Seattle Hula Productions presents our 1st Annual Ho’ike (dance recital). The dancers of Seattle Hula Productions invite you on a journey through Hawaii’s history. Watch the beautiful transformation of the Hula from its earliest beginnings with the arrival of the first Polynesian settlers from the Marquesas Islands & Tahiti with songs dedicated to King David Kalakaua. The magic continues from our last reigning Queen Liliuokalani to Christian Hula to modern day Hula to today’s Hawaii as a true melting pot. Even Madame Pele will grace us with her presence during this performance! This event will also help start the Kamakana'akealoha (Gift of Love) Foundation. This non-profit organization will provide a space where we can share the Hula and offer academic help to challenged and underprivileged teens.